For my daughters’ birthdays this year I made them each a birthday crown. 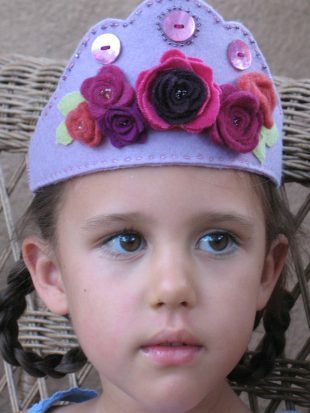 Made of felted wool and embellished with tiny seed beads, these crowns were stitched of love, a little elbow grease and some tears. As my older daughter neared her fifth birthday, I began to reflect on the past years. As a new mother with my first baby I had no idea what I was in for. With a two week old in arms, I watched as my husband drove off to work. I was alone for the first time, with this new helpless life. I tried to be brave, but it took a long time before I would feel courageous again. Becoming a new mother feels like you have become a well broken-in horse. Say goodbye to that wild and free horse. Those days are gone, like it or not. Or maybe you are more like an old rag that has been turned inside out a few times and rung out. The person you have become slightly resembles the person you used to be, but you are more stripped down, more bare, your movements and actions become essential. From this new experience, you grow a new delicate skin. It takes much time for your new skin to become comfortable. Your old self is long gone and you no longer belong to yourself, or so it feels. Accepting this is sometimes the hardest part. It has been five years since those days and my skin has grown thicker. I have learned the hard lesson that… no, you can not do it all, despite what you grew up thinking. Actually, not even close. I have pared things down to the necessities of our simple family life. I work when I can, paint when I can, try to keep up my relations with family and friends, try to keep a house and little garden, and often these things fall short. Mostly I am a mother. I learned this new role hard way, the way only a new mother can learn things… by trying to do be my old self and to be a mother at the same time. With those expectations came many disappointments. I guess I eventually realized that it might be better if I just tried to be a mother first and the other things would fall in where they may. As soon as I relaxed into this new reality of myself, I began to relax and enjoy motherhood. With the coming of my second daughter joy came more naturally and in some ways things are easier than they were when my first child was born. Life is hectic and frantic at times and peaceful and sweet at other times. Being ready for all of these things in any moment is the key. As I made the preparations for my daughter’s fifth birthday I entered this day with a new child growing inside my belly. Extending another arm to new life, and moving one step further from my old self. I was preparing her birthday meal when I felt my pregnant tummy rumbling for, yet again, more food. I found the last cinnamon raisin bagel in the fridge and looked around to see if anyone else noticed. As the bagel began toasting my five year old said “what is that smell Mama, are you toasting a bagel?” I tried to think fast, but came up short. “Yes, but the baby in my tummy is very hungry and I need to eat this bagel…..Yeah, um ok, you can have a few bites”. Then, my toddler walked up and wanted to know what we were eating. As you can imagine, I ended up eating part of a bagel. I think I will change the wording of that horse metaphor from broken-in horse to broken-down horse. A broken-down horse is wiser than a wild young horse though, right? More than the discomfort that comes with parenthood, I notice how much I have grown. Parenthood has a way of forcing personal growth. Anyone looking for a deep spiritual awakening? Try motherhood. It’s not romantic, but it’s a great way to let go of your ego and learn to live in the present. Tonight I watch as my girls peacefully sleep and I watch in wonder. My girls who still give hugs freely, who look up to me and believe everything I tell them. I am much of what makes up their world and how deeply fulfilling and humbling that is. Nothing can touch our love. Nothing. That is all I really need to know most days. Mothering has become my high powered (and underpaid) career, my ego boosts coming from my daughters’ smiles instead of that big promotion. I may not have time for the things I used to enjoy when I was younger, but I can carve out a little time to make handmade birthday presents for my girls now and then. The fulfillment of that is worth giving up almost anything. Becca, I almost called you yesterday. I was having one of those days with a newborn and a toddler where all I could think was “I can’t do it!! !” and needed to hear from someone who has been there and survived (instead I had a good cry and took a nap, which helped). Also, I was wondering what you did for the girls’ birthdays this year. 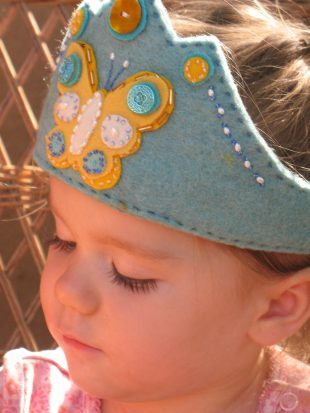 Those crowns are so lovely, what a wonderful gift for them. My dear Becca, this brought tears to my eyes! Thank you for sharing your beautiful experiences with us….I’m so happy know you as such a kind, giving example of a mother. Cheers to Baby #3! Becca- So lovely this tale of wild horses and wise mothers. The softening into motherhood you have show is a grace I aspire to, As I am still a bit resistant of my reins at times, but loving my own honed strength as well. I am going to forward this to a brand new mama I know, always good to share another wise voice.